When it comes to forecasting, the IMF is virtually always wrong to a large extent. Indeed, often they are spectacularly wrong as was the case with the financial crisis of 2007-2009. Why anyone ever bothers to listen is really baffling. They never admit mistakes and are clueless about forecasting any change in trend. What is in motion, just stays in motion. The IMF is going to make another spectacular mistake and it appears they are really going to be so wrong this time, if they were in private business, they would surely be out of business. It is debatable whether or not they can even beat a broken clock that is at least correct twice each day. 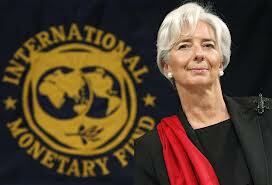 The head of the IMF is a lawyer, Christine LaGarde. The mere fact that lawyers are appointed to run just about everything in government demonstrates why formal education is a waste. Would you hand all your money over to your attorney to manage your pension? How about to person who is the newscaster at the local TV station? Yet we hand the world economy over to lawyers who want to be presidents and who are appointed to run the IMF. Therein lies our problem. These people then are clueless and experiment with the world all the time. We just pay the price for their dreams of power.